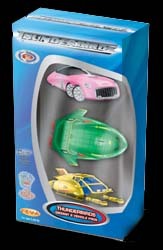 These die cast vehicles are available in single blister packs (RRP £3.99) and boxed sets of 3 vehicles (RRP £9.99). One of the greatest things about Thunderbirds is the rescue craft and with a new, live-action movie about to arrive on cinema screen nationwide we're soon going to be inundated with merchandising, including a range of replica vehicles in various sizes. Amongst them are two sets of die cast models from F.E.V.A. 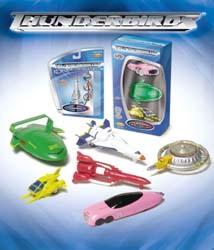 Set one includes Thunderbirds 2 and 4 and FAB1, while the second set feature Thunderbirds 1, 3 and 5. 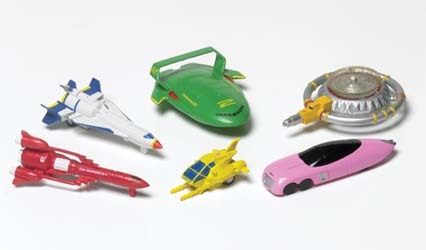 Purists may not like the redesigned look of International Rescue's craft but there's no doubting that these little vehicles are both well made and highly detailed. 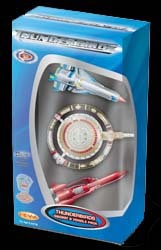 The only slightly strange thing about the six toys is a 'pull back and go' motorised action that seems a little retro for a modern audience of preteen consumers.